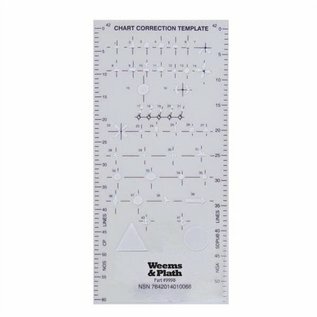 Chart Correction Template contains the Region A & B IALA Maritime Buoyage symbols required for updating and correcting nautical charts. Keeping charts updated with the Chart Correction Template helps ensure the safety of your crew and vessel. 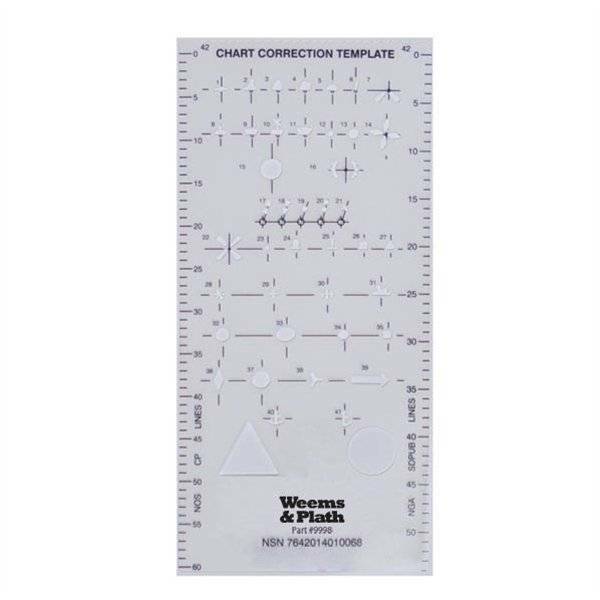 Designed for use with a fine line pen, corrections to nautical charts can be made neatly and quickly with this simple-to-use stencil. These corrections then become a permanent part of the chart. Corrections should be made in ink so they will not be accidentally erased when you are using the chart. Please reference US Nautical Chart No. 1 or UK Admiralty Chart 5011 for assistance with symbol identification. An exact replica of the Chart Correction Template formerly prepared and published by the National Geospatial Intelligence Agency (NGA). TIP: Always check the Local Notice to Mariners and the Broadcast Notice to Mariners file to ensure the chart is fully corrected. Keep a log on the chart or a chart correction card of all the corrections that have been made; this will make it easier to verify the chart’s correction status prior to its next use.